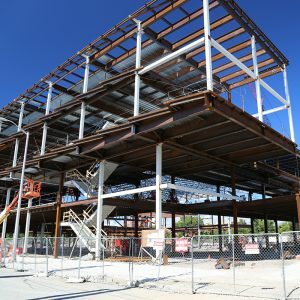 HFHS Pistons Performance Center – Testing Engineers & Consultants, inc.
TEC was initially retained by Henry Ford Health System to perform a geotechnical investigation of the site that will be known as the Pistons Performance Center in the New Center area of Detroit. The proposed development consists of construction of three components, the Detroit Pistons Performance Center (DPPC) on the east, the Henry Ford Health System (HFHS) Center for Athletic Medicine (CAM) on the west and a parking structure in the middle. The purpose of the investigation was to assess subsurface conditions and basic engineering properties of soils at the site. A series of 43 test borings were drilled and laboratory tests performed on the soil samples obtained during the field investigation. This information was evaluated and presented in a final report that presented our field and laboratory results; engineering analysis; and our recommendations for design of foundation and slabs, as well as important construction considerations for each of the proposed structures. TEC’s scope was expanded to include construction materials testing services for the proposed development. TEC is providing Subgrade proof roll observation and density testing of basement/utility backfill and building pad preparation; as well as Inspection of reinforcing steel, field testing of fresh concrete and laboratory testing of compressive strength cylinders; and engineering oversight. All laboratory analyses, data interpretation and recommendations for the project(s) are provided in daily, weekly and monthly reports.